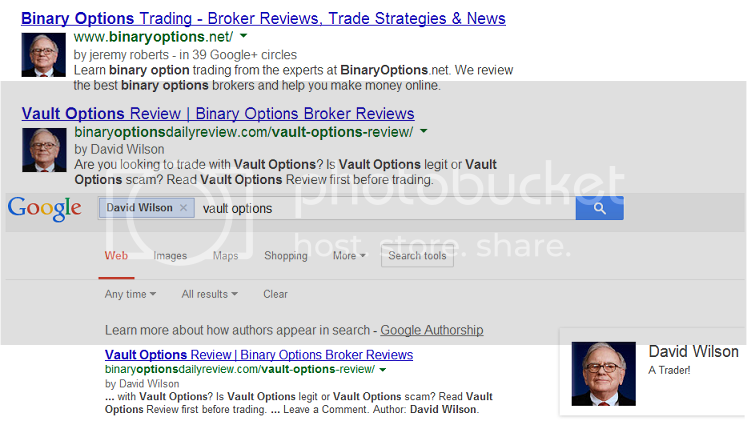 Both BinaryOptionsDailyReview.com & BinaryOptions.net are using Warren Buffet as their author pic for Google Authorship. 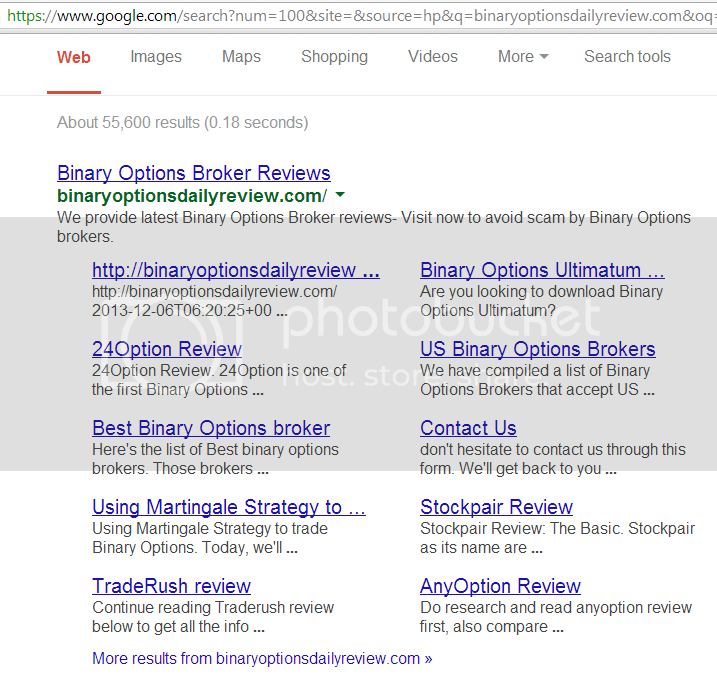 I guess that make sense since Google considers BinaryOptionsDailyReview.com and authority site as you can see by it's menu-styled listing below. Scammer Irony, use the image of a man who largely recommends a lifetime holding period for investments to pimp what is essentially gambling. Although, if I were going to run a con this is the way to do it since people will willingly take bets where the odds are against them. And if someone beats the odds by too much, just shut the site. WIN WIN. The review sites are a ingenious twist on this, just set up a page and a few referral links, totally unbiased for sure. Its interesting, Facebook seems to have a lot of this crap popping up. I suppose if you pay to promote they could care less if what is being promoted violates their so called community standards against illegal activities. To my knowledge NADEX is one of the few exchanges that can legally do business with US citizens. Can offshore "brokers" trade with US residents? In the case of off-shore platforms offering binary options to retail customers in the United States, the answer to this question is a resounding "No". “I’ve proven to him that, mathematically, the site has an edge and you must be right 55% of the time in order for your bet to have a neutral expected value. I am afraid to start gaming or I would never leave the house. Facebook seems like they are not even trying to cut down on fraud, and this article certainly confirms it. They must have it modeled that these are the best revenue streams and customers to have? The phone companies say they recently moved to stop some of the cramming, how long will they continue to absorb losses so websites can profit? OR is this such a good revenue stream that it is all a wink and a nod.. Just placate the folks who complain and cash the checks of those who don't.